With over 50 photographs that clearly illustrate the practices and gestures, detailed, step-by-step instructions, and scripts for guided relaxation and meditations, Yoga Skills for Therapists is a practical, hands-on guide that teaches the power of basic yoga techniques to bring great self-awareness, balance, and lasting well-being to you and your clients. 30 photographs. 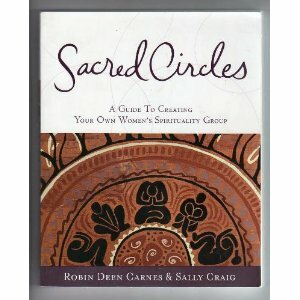 Sacred Circles: A Guide To Creating Your Own Women’s Spirituality Group, by Robin Deen Carnes and Sally Craig. From Jewish to Christian, Mormon and Pagan, women’s sacred circles are sprouting up everywhere, in astonishing variety providing a haven where essential female values can be discussed and embraced.This much-needed guide celebrates the rich diversity of women’s spiritual lives and offers practical, step-by-step advice for those who want to create and sustain a spirituality group of their own. Sacred Circle shows us how we can use a group to explore our relationship to the sacred, and honor the divine in everyday life. The authors, drawing from their own group experiences as well as those of many diverse groups around the country, share the model they’ve developed, while offering wise advise on how and why groups work. They propose circle basics, such as listening without an agenda and rotating leadership, and also offer reflections on the power of personal storytelling and thoughts on reclaiming and reinventing ritual. Women longing for a powerful and supportive feminine community in which to thrive spiritually will find vital wisdom here.